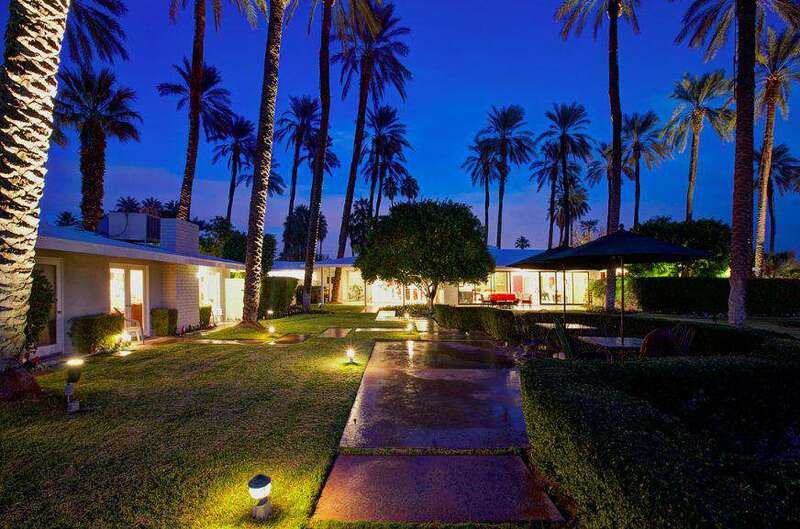 La Quinta Desert Spa Resort is located in one of the most desirable locations of Palm Springs.Fully remodeled house. Spa House located next to the over sized swimming pool and jacuzzi provides resort amenities such as a juice bar, gym area, spa, a separate massage area, 2 whirlpools baths and a sauna. Upon entertaining the main home, a white baby grand piano can be set to echo electronic music enhancing the ambiance which flows into the elaborate one level open floor plan. The large but cozy Lanai outside the huge living room has panoramic views overlooking the lavished manicured grounds. The Dining Room is not only tasteful, but also functional. Whether you're planning to entertain a large sit down party of 12 or an intimate dinner for the family, it will fulfill all of your entertaining needs...to include a pass through granite counter for buffet style dining. The fully equipped Gourmet Kitchen proudly exhibits a Meile' coffee/espresso/cappuccino maker with Bistro, a commercial Viking oven...just to mention a few of the dream amenities in this one of a kind setting. The spacious Master Suite includes his and her white leather recliners with a large flat screen and an office area which welcomes spectacular views of the majestic mountains nearby. The invigorating Master Bath displays a rock grotto shower with 6 massaging shower heads, a steam bath Jacuzzi tub with a view, as well as a bidet and dual vanities. A private and secluded outdoor veranda invites an in-ground hot tub and rock-Zen garden. The other 4 additional bedrooms in the Main House are complete with their very own flat screen, baths and private patios. Both the Main House and the Guest Lodge open to the beautiful lawns, pool and Jacuzzi. If you prefer shade, there is a Bougainvillea covered gazebo with lounge chairs to take in the serenity. You and your guests will enjoy the comfort, luxury and conveniences of each suite in the Dupont Estate. At the end of you evening , cherish your vacation memories as you relax by the outdoor fire pit. The retreat has Wi-Fi and is fiberoptic! Fantastic location close to El Paseo (the Rodeo drive of the desert), with a wide selection of shopping (Costcos, Trader Joes), restaurants, hiking, tennis and golf just minutes away. Massage Therapists, chefs and chauffeurs are available upon request. entertaining family and friends. Depending on the availability, the Main House and the Guest Lodge can be rented separately. The property is available for large parties, weddings, special events, location shootings, commercials, etc. Please inquire for pricing on all events. Please inquire for Coachella Valley festivals and events, holidays, weddings and special event rates as they may be higher.